Good morning again! This is another 2-page layout I put together for my daughter's album. These are some family pics from the hospital. Oh she was little - it's hard to believe because she's 16 months now! 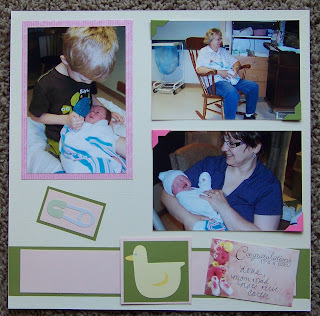 This layout was made using a pre-made border set I received in a swap. I added the pictures, photo mats (Debbie Mum), photo corners (MS punch), and the epoxy title stickers (Debbie Mum I think). Quick and easy!